How much fun was month one? We had an absolute blast, and mainly thanks to your participation and rolling up of the sleeves; it surpassed what we had hoped for this workshop. What do you say we keep up that momentum? Love the standard of digging in and going hard after marriage growth that you all set! Because month one (Mission & Vision) is so ‘shoulder to shoulder’ (that term makes sense if you watched our March webcast), we wanted to balance that by making April all about face to face. 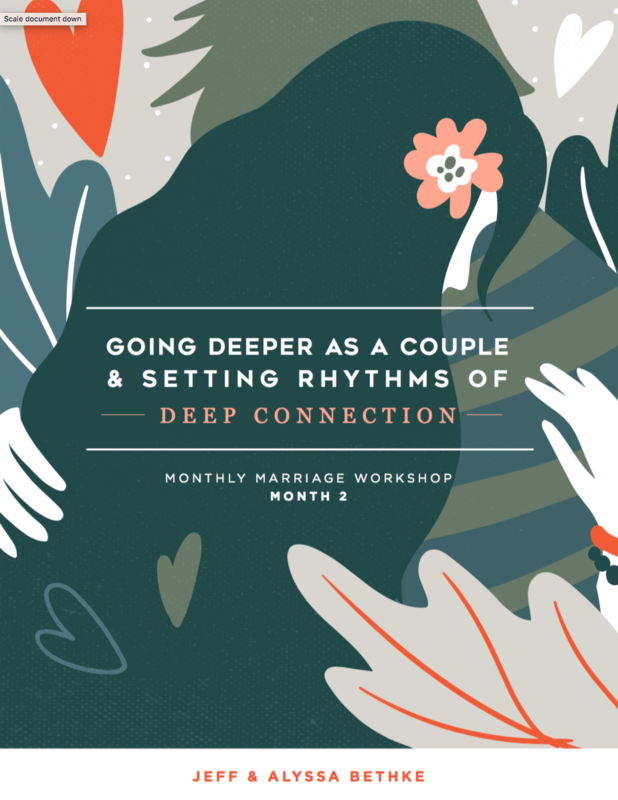 Because if we are honest, deeply connecting is actually very hard for a lot of us, and many of us just then put our marriages on cruise control in this regard and concentrate on digging in deeper to other stuff (work, kids, school, etc.). The main point in writing this quick letter though, as will be true every month, is to get all of us on the same page and to make sure everyone knows WHAT TO EXPECT for this month. So, as a reminder, we want to layout the general rhythm of how it’ll work every month. On the first of every month, we will write a letter similar to this announcing that month’s topic and theme as well as the date for the scheduled webcast within the first week of the month (which is below). And the reason we want to announce the topic with a few days before the webcast is because we think the webcast will be firing on all cylinders if you all are already thinking about the topic and asking yourselves a couple of questions, and coming with the theme on your mind! By the way, the webcast will always be recorded and reuploaded to the membership site for you all to watch it whenever is most convenient for you. But tuning in live, if you can, will allow us to have a fun Q&A section and good discussion. Webcast: 4:30 PST on April 8th, on the Monthly Marriage Facebook Group. Please note: it’s usually the first Sunday every month, but April 1st is Easter. We figured you all would rather be eating ham and cheesy potatoes and celebrating Jesus walking out of the grave instead of watching us on Facebook Live! Remember, the webcast will always be the WHY and the rest of the month will be the HOW. We want the webcast to be a place where we teach from a 30,000-foot level and then get on the ground for the nitty gritty the rest of the month. I am also so excited about how this month’s activation guide PDF turned out. You can download it and take a look at the link below, or you can access it under the ‘current month’ tab on our membership site.